The logo for GGI2017 is today revealed to the universe. It is based on a map of the world by Gerard van Schagen, a Dutch engraver who lived from 1642 to 1724. His world atlas of 1689 was produced using copper engraving and consists of four views of the globe, including views of the north and south poles. Ireland is located close to the centre of the map. Five arrows emanate from the island and travel to Iceland, North America, South America, Africa, and Australia. These locations will feature prominently in some of the talks at this year's conference: Gisli Palsson will discuss the Book of Icelanders; Hannes Schroeder will discuss the TransAtlantic Slave Trade; several presenters will be bringing an American perspective to proceedings (Roberta Estes, Dave Vance), whilst others hail from Scandinavia (Peter Sjöland, Hannes Schroeder) and Australasia (Donna Rutherford). The range of topics and presenters serves to underscore how we are all inter-related and how our histories are completely and inextricably enmeshed. The intersection of the arrows creates several triangles. 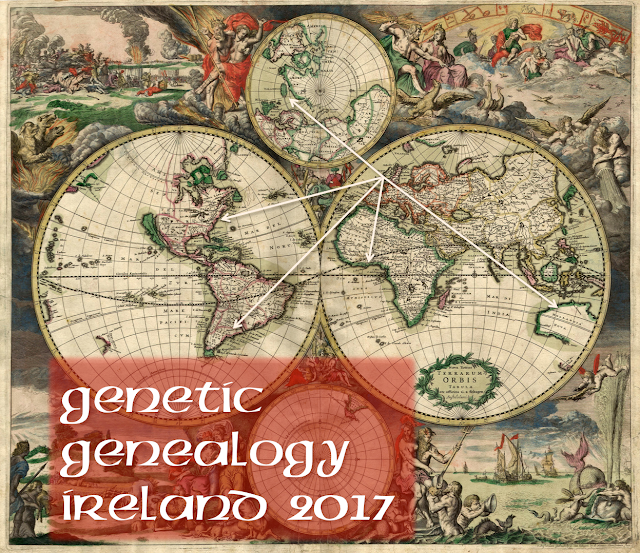 And Triangulation is a topic of several of the talks this year - using the DNA of several related people to focus on a particular ancestor (Debbie Kennett, Maurice Gleeson, Roberta Estes, Paddy Waldron). This ancient map reminds us of our deeper roots and both Dan Bradley & Eppie Jones will be discussing ancient DNA and what it is telling us about early Europeans, including the early Irish. On a related topic, Gianpiero Cavalleri will discuss the deeper roots of the Irish Travellers as revealed by DNA. Finally, the atlas is a suitable icon for the final results of the Irish DNA Atlas Project which will be presented at the conference by Ed Gilbert. This project has been running for over 5 years and it will be fascinating to see what it reveals about the DNA of the people of Ireland. Well done characterization of the talks in the context of the world atlas. Looking forward to attending again this year. Thanks Maurice!